Advice for land owners re: wind turbine leases. Don’t give it all away for crumbs from the table. Should you lease the wind energy rights to your land? Enxco Land Lease, -an example of what you might expect. Details are different with each developer. WAIT-PW is dedicated to preventing wind turbines from being erected in Plympton-Wyoming. One way to prevent them is to have no land leases to wind developers. We urge you not to sign a land lease agreement! 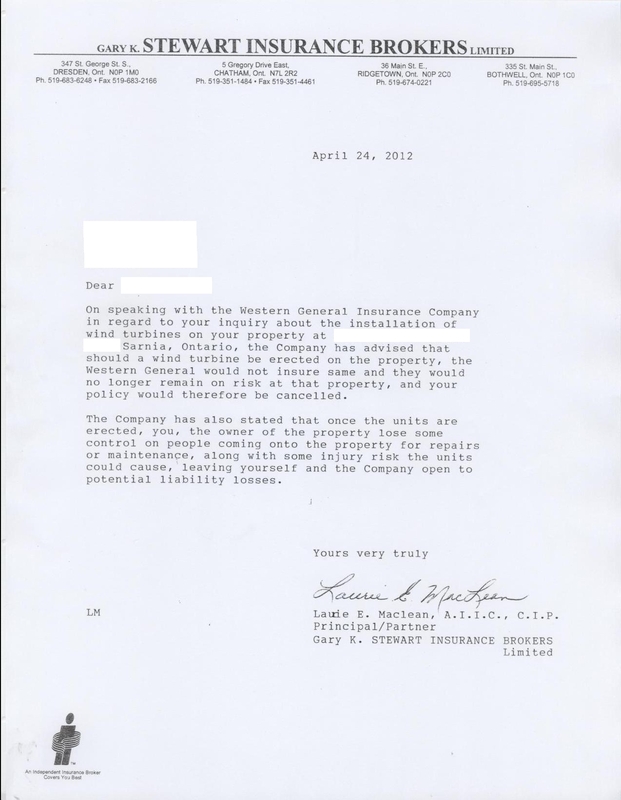 Read this letter from an insurance agent who will cancel a client's insurance if wind turbines are installed on the property. Unless a wind farm developer owns land, they have to lease land from landowners in the area. Developers pay a farmer, for instance, to lease his land to erect wind turbines. These lease agreements are done under contracts. Contracts are the subject of much controversy. This has become an even hotter topic around Lambton County in the recent past. You may know land owners in your neighbourhood who have signed leases. Land leases may have already been renewed for possibly as long as 50 years. Other lease-holders may have leases coming up for renewal. Still others may have signed leases, and now wish they hadn't. We do know that there are land lease men all over the area at different times, looking to get new leases signed. They work on commission and need to earn a living. At times, they have been known to come to the door with two representatives, to add a little pressure to their pitch. They may tell you all kinds of things about why you should sign up. You may hear statements like, "All your neighbours have signed up." They may make it sound too good to be true. Be wary! Here's a photo of a typical wind turbine base being installed. Do land lease holders, or those curious about it, envision what it will mean to their land? A wind developer usually erects a meteorological tower on leased land about a year in advance of planning for a wind development. They measure the wind speeds and consistency to see if the site is favourable. You may see these "met towers" in various locations in our area. Our municipality confirms that no building permit is required to erect a met tower. Before you sign any contract, you are always advised to seek legal advice. It is no different with wind turbine land leases. I emphasize this--always seek reputable legal council before signing. Know what's in it for you (legally, not just verbally), and all the stipulations. In some cases, you may be able to get out of a lease. Again, seek legal advice on the lease you have signed. We do not provide the names of law firms dealing in these matters. Here are some links on the left side, to articles on various web sites dealing with the issue. Some of them are older, from several years back in some cases, but the basic information hasn't changed. Where an article originates outside Ontario, some references to taxes and other details, may not apply here. This page is under constant development. As more articles and links are found, we will post them on this page.